Do you have a soft spot for Africa’s big cats? 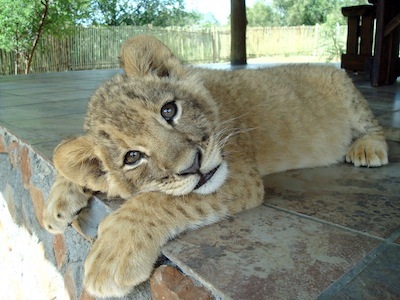 Do you find safaris exhilarating but secretly wish you could jump out of the jeep to interact with the cuddly lion cubs? If you’re nodding your head, then this article is for you. 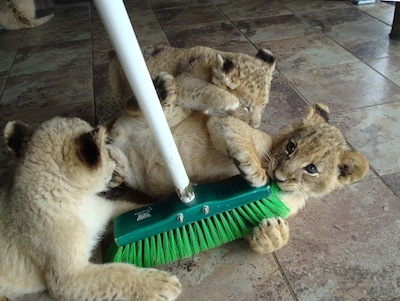 Volunteering at a Lion Research Centre is a rewarding way to make such dreams come true. It gives you ample time to get to know the cubs’ individual personalities and you can play with, bottle feed, and bathe the cubs as part of your package! You do, however, need to be accountable, not mind getting your hands dirty, and be available for duties any time between 7 a.m. and 7 p.m. depending on your rotation. Choosing your placement carefully is essential to ensure you have a positive experience. You will want to work with an agency that cares about the welfare of the animals and of the volunteers. Jinnie (info@africatime.co.za) from Hands-on Holidays was able to find me just the right mix of comfort, purpose, and adventure. She recommended Ukutula, in a malaria-free zone, an hour and 45 minutes from Johannesburg airport. They provided three lovely meals per day and a very comfortable chalet (not a tent) with a hot shower. A basic two-week package (excluding airfare) currently costs $1,530 (based on two sharing) or $1,740 (for single occupancy). Transfers and excursions cost extra. Two weeks minimum is preferable. The local currency (ZAR/rand) can fluctuate greatly so prices listed in dollars will vary. You may also want to bear in mind that nights are chilly July through August. Your fee helps the Centre pay for the lion, cheetah, and tiger food and their medical checks. The longer you stay, the cheaper it gets. How busy you are depends on how many volunteers work there that week. If smelly work and early starts aren’t your thing, you can still visit Ukutula as a guest. You can stay in their luxury chalets (they sleep 3-6) and just pop over to play with a small cub or go for a walk to a water hole with a small group of teenage lions. Watching them run around freely is incredibly relaxing and safer than it sounds. An experienced guide will accompany you and about six other visitors and explain all about lion psychology. Such a package costs between $450 and $780 per chalet for three nights, self-catering. Gourmet meals can be provided at around $55 per person per day (50% off for children). In your spare time you can enjoy a guided walk around their fenced private reserve and look for giraffes, eland, and zebra, or see them (and many of the usual suspects) in Pilanesberg, a very scenic Big 5 reserve just 45 minutes away — it even has a lake and observation deck for bird watchers. Right next door is Sun City and an excursion there offers very different thrills! The Palace of the Lost City (the “Jewel of Africa”) has a striking architecture and its Valley of Waves pool ($15 entrance fee) is truly decadent. Step on its Bridge of Time when it shakes on the hour or just enjoy the myriad of entertainment. www.holidayssouthafrica.co.za. Check out the various options and see where your heart takes you.